Graduates during the Last Bell celebration in Tara, Omsk Region. How did you celebrate the end of high school studies? We bet it had nothing to do with birch tree planting and waltzes. For Russian students these things are par for the course. It’s that time of year again. 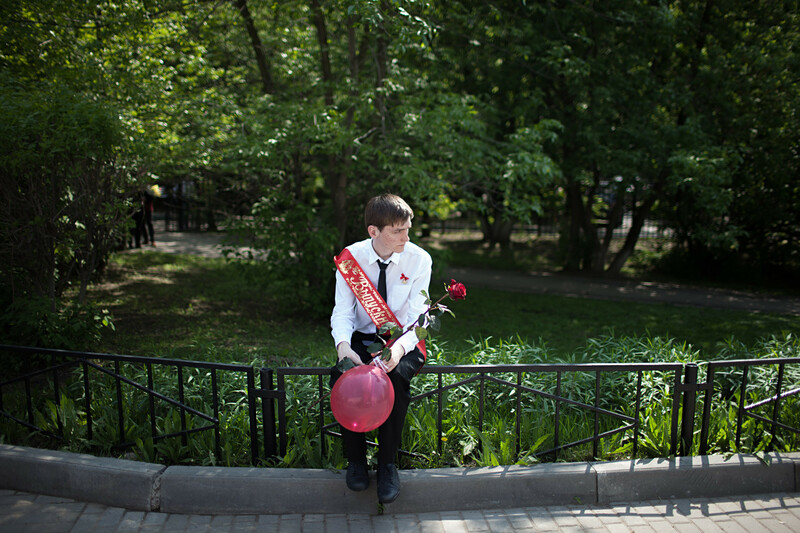 The prospect of final exams weighs heavy on the minds of Russian students, but their “Last Bell” and graduation celebrations will provide some solace in the form of a Soviet-inspired spectacle. I visited a school in southwest Moscow to investigate. 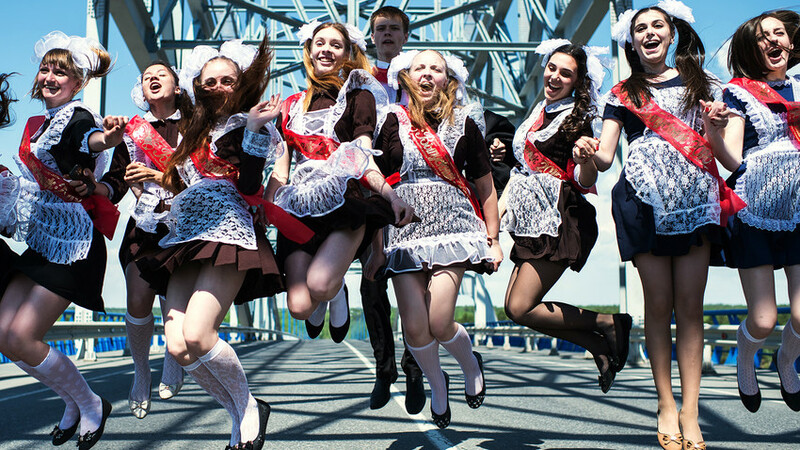 The “Last Bell,” or Russian students’ last day of school, is a rite of passage that dates back to the 1950s. With exams looming large, this oddity-filled day is the only afternoon when 20 students graduating today from School No. 2035 can be to themselves for a while. Not that this day is a time for relaxing, either. It surprises me how much effort the girls have put into preparation for this, wearing apron-adorned 19th century outfits that look as though they’re more ready for a spot of spring cleaning than for a graduation ceremony. Schoolchildren dance at the Last Bell ceremony at Magnet School No. 8 in Sochi. The dance, as it turns out, is not some kind of teenage cringefest (my year’s final performance was a moshpit, performed in front of horrified parents to “Bohemian Rhapsody”). These students instead perform an elaborate waltz with well-rehearsed pivots and flurries. It wows and leaves everybody happy. The ceremony is striking for how traditional it is, and how much the kids get into it. Although they try to explain it as ineffable teenage indifference, it’s clear that the ceremony means something to them. “We are starting anew, we left a part of us behind,” says Ksenia, explaining the planting of a birch tree with the first graders, a ceremonial torch-passing moment. Of course, Russia has a weird obsession with the birch tree, using it to make juices and bathtub-exfoliators, among other things. Why stop at graduation ceremonies? School graduates during open-air celebrations on Irtysh River embankment. Of course, the flamboyant but old-fashioned aesthetic of the Last Bell feels very much managed by the teachers – there is a heavy sense that the real festivities are yet to come. Although they assure me that celebrations following the Last Bell will be relatively muted (“hanging out, going to the city center, that kind of thing”), the students are more hesitant to tell us about the graduation party in a month’s time. The typically lavish affair is usually characterized by glamorous parties – sometimes in the city center, sometimes in nightclubs. “We’ll go to a restaurant together, to celebrate passing our exams,” says Ksenia. When asked if parents are forking out over $600 for the party, the students are coy. “We don’t know, but it’s a bit expensive, yes,” says one. A graduating student at his Last School Bell ceremony at school No. 1517 in Moscow. Contrary to teenage stereotypes, most students we encountered seem more focused on their results and ambitions, and have big plans for university. Nikolai’s friend Azat tells us that it is his dream to attend Moscow State University, where he plans on studying sociology. I’m taken aback by the extent to which the students not only know which field they want to pursue and in which university, but exactly to which career it will lead. Of course, this wasn’t the case for everyone – other students have more open plans. “I will do the IT and English exams,” says Alex, “But I don’t know how to connect these two subjects. Maybe I’ll be accepted at a university. I won’t do a gap year, because they’ll take me to the army,” he jokes. But first, the students will embark on their surprisingly modest summer plans. In full knowledge of the time and energy that state exams are likely to exact, the students didn’t seem to be tempted by any Russian equivalents to Magaluf or Cancun. “I’m just going to chill, I don’t want to go anywhere,” says Alex. Ksenia, meanwhile, is perfectly content “just going for a walk” this summer. Some are just easily pleased, I guess.